Carla Stewart here. Hope that you've had a chance to take a road trip and enjoy this beautiful fall weather. It's time for us here to continue our journey on historic Route 66, the Mother Road. If you're just now joining us, you can catch up with the sights we've already explored here and here. We left off in Tulsa, which now welcomes travelers to meander through this city known for its Art Deco architecture and beautiful hills. Below are the modern entrance and a vintage motel on old "66" in Tulsa. At one time the Will Rogers Motor Courts was on this same stretch through Tulsa. 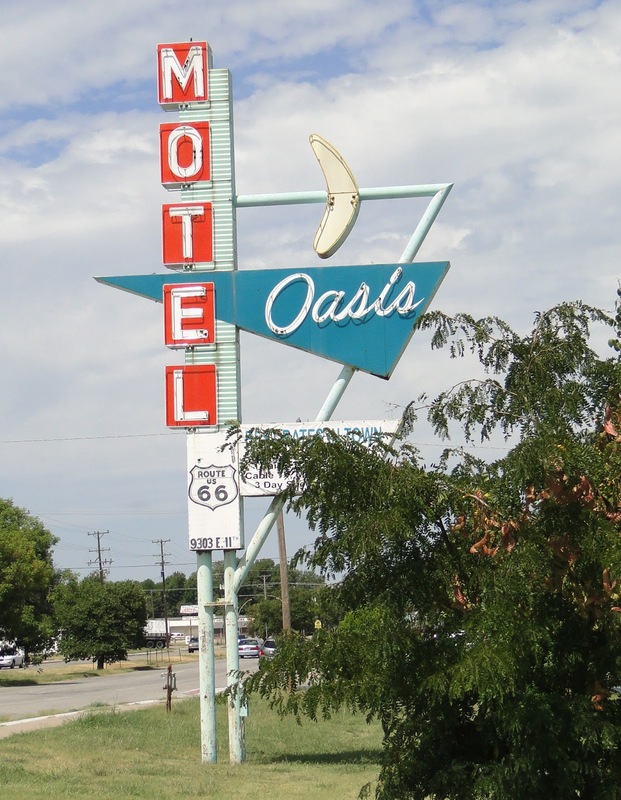 The Oasis Motel in Tulsa - from the glory days of 66 and still in operation . Through rolling countrysides that once was home to the Creek, Cherokee, and other Native American tribes, the road passes through Arcadia, Oklahoma, home of the Round Barn. The barn, built in 1898, predates "66", and locals say that when new, a person standing near a wall could hear a pin drop on the other side of the building. Many people spent their evenings here dancing to the fiddle music in the early days of Oklahoma statehood. The highway cuts through Oklahoma City where once the Kentucky Club overlooked the road from Persimmon Hill. Reputed to be the hangout for outlaw Pretty Boy Floyd, it was a colorful roadhouse frequented by bootleggers, gamblers, and painted ladies. Today, it is more respectable and has been renamed The Oklahoma County Line and serves up a variety of tasty barbecue. Indian trading posts, filling stations, and country cooking diners like Jigg's Smokehouse and Johnnie's Grill dot the rest of the road in Oklahoma. Elk City, near the Texas border, hosts the official National Route 66 Museum where you can find an old pickup truck outfitted like the one from The Grapes of Wrath. The Mother Road cuts through eight counties of the high plains of Texas. This is cattle country, wide open with no seeming end before you reach Amarillo. Just outside of Amarillo is the Cadillac Ranch. Built by Stanley Marsh in 1974, the ten Cadillacs are planted nose down at the exact angles of the Great Pyramids. 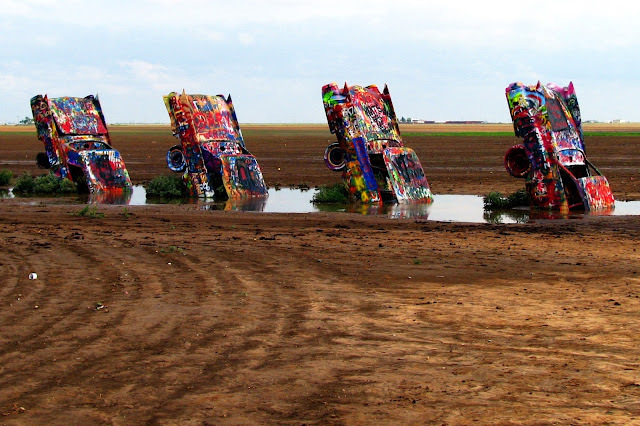 The abstract art, covered with graffiti, symbolizes the American fantasy - After WWII, to own a Cadillac was a dream come true, and this hard-edged prairie sculpture depicts that. Ghost towns dot much of the rest of the Texas strip of "66" but New Mexico beckons. The Blue Swallow Motel in Tucumcari is still in operation, its neon sign still open for weary travelers. The old road winds through sagebrush where once giant buffalo herds roamed, hunted by Comanche Indians. Much of the terrain looks like a barren wasteland earning it the name "the great Sahara of North America." It was the home of many cowboys, American settlers, and gunfighters. Spectacular sunsets can be seen most evenings in eastern New Mexico, but if you train your eye to the north and west, mountains rise from the horizon. 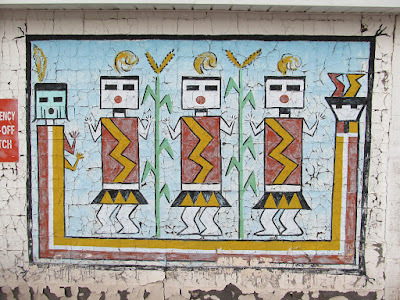 In the early years of Route 66, Santa Fe was part of the trail. This magical mountain city - the oldest European-settled community west of the Mississippi - was also the end of the Santa Fe Trail. In 1937, a straighter route bypassed Santa Fe and many villages in the vicinity, saving westward-ho travelers as much as four hours of travel time. Today the route parallels I-40 through Albuquerque, nestled beneath the Sandia Mountains and spread out over the Rio Grande Valley. 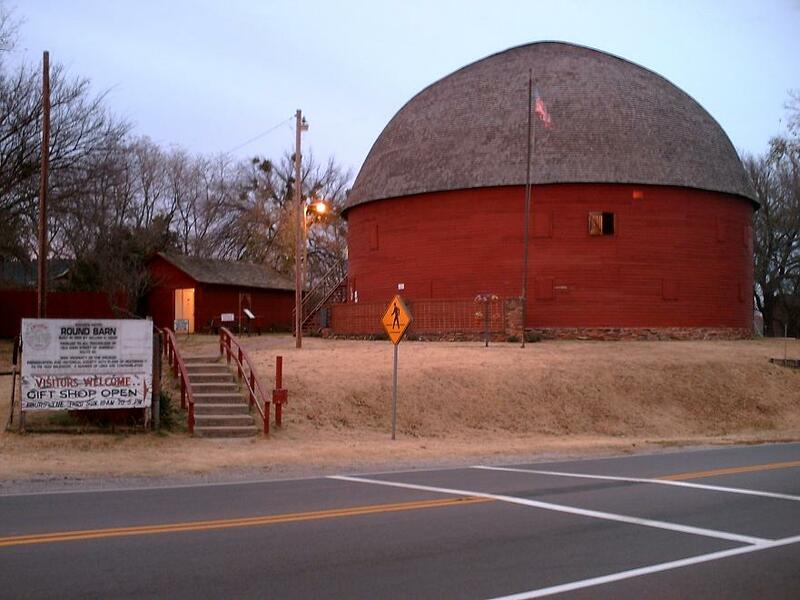 Manny Goodman's Covered Wagon Trading Post sits on the eastern edge of town. Albuquerque's Old Town district is dotted with motor courts, diners, and souvenir shops. The road begins a steep incline as you drive west up Nine Mile Hill. 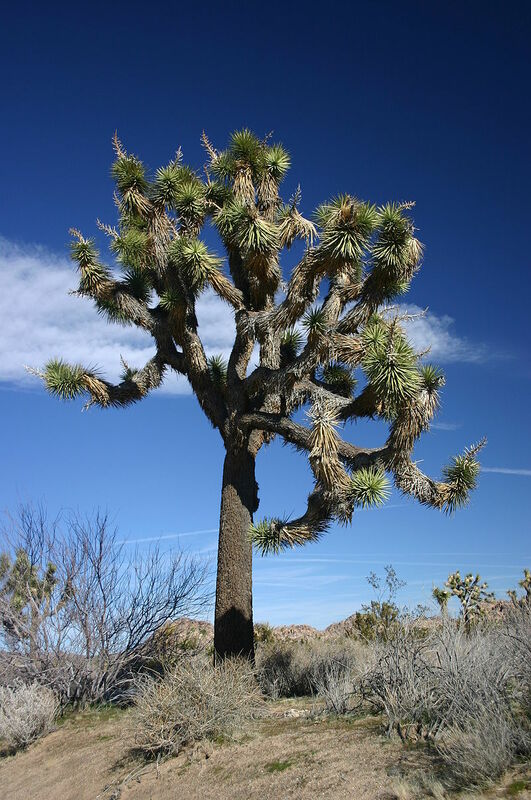 It is a land of pinion trees where pueblo homes once graced the landscape, but soon there are endless miles of black lava fields with sharp-edged formations, an area given the name malpais, Spanish for "bad country." Today it is still referred to as the badlands. Grants, NM - a railroad mining town had establishments like Pat's Lounge, the Silver Moon Bar, and Speak Easy Grill. Just ahead is Gallup, sometimes dubbed the "Indian Capital of the United States" since it is surrounded by the Navajo Reservation. Gallup at twilight is a ribbon of neon lights with myriad trading posts that sell jewelry and the many fine arts of crafts of the New Mexican tribal people. 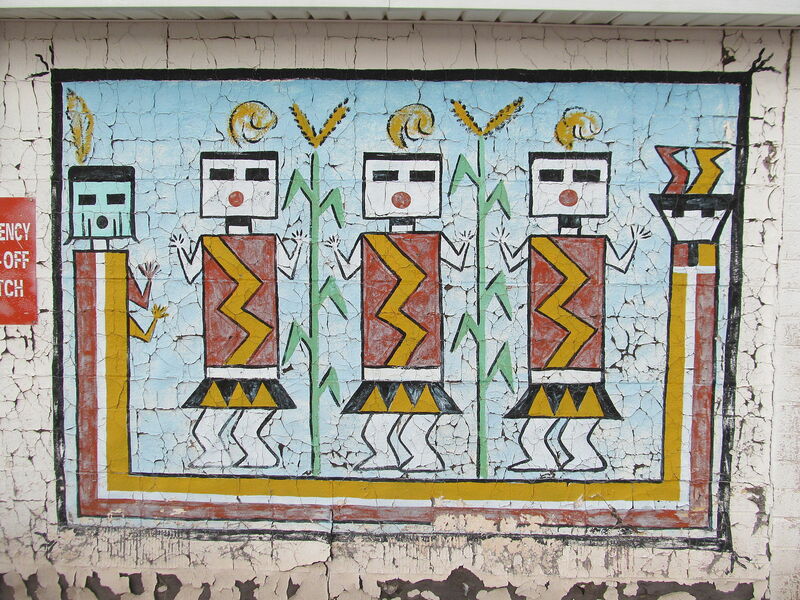 After the stark, sometimes bleak miles of New Mexico, Arizona offers splendor along Route 66. 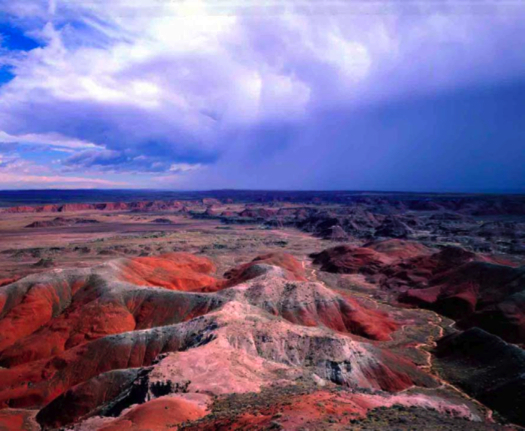 The highway skirts the edge of the Petrified Forest and the Painted Desert that is part of the Navajo Reservation. Both are worth a short side trip to feast on the sights. The first major town is Holbrook where travelers can stay at the WigWam Motel, built in 1950. 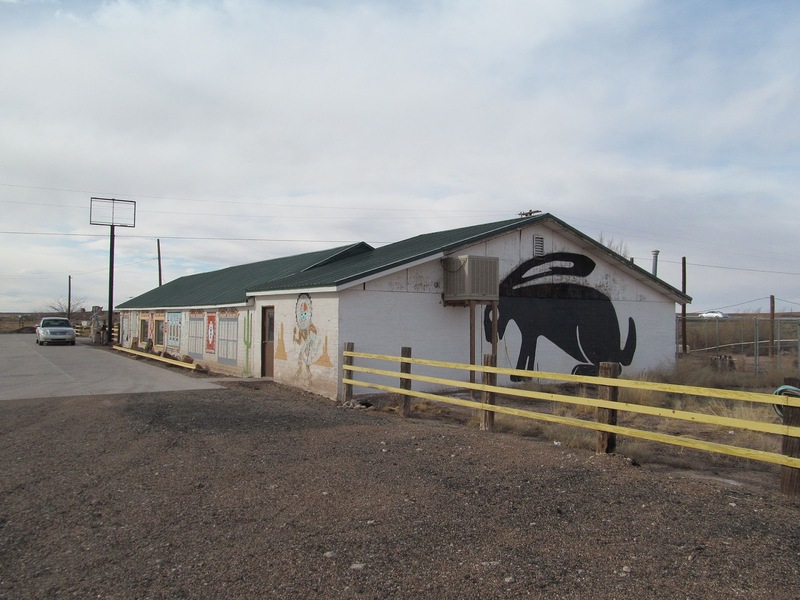 Just past Holbrook, headed west is one of the most famous tourist stops - the Jack Rabbit Trading Post. Here you can have a cold cherry cider and buy everything from postcards to a whimsical stuffed Jackalope - half rabbit, half antelope. Route 66 continues along northern Arizona, still replete with diners and businesses that herald the Indian culture of the Old West. Flagstaff is in the mountains, and it's here that you can turn off to the Grand Canyon, one of the most majestic sights in all the world. Breathless wonder will make you glad you stopped. As the road winds west through Williams and Kingman, it soon gives way to the Colorado River valley and just across the bridge - California and the unforgiving Mojave desert. Needles is a sun-baked town just across the border and is one of the oldest towns in the desert. 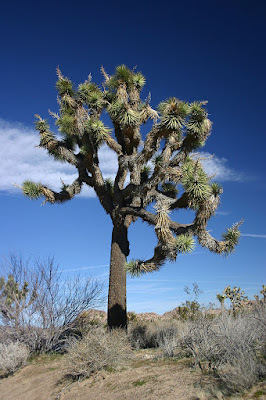 The land across the Mojave is bleak, dry, and hot, the landscape dotted with scraggly sage brush and Joshua trees. Barstow and Bakersfield offer some respite for travelers, but the ultimate end, and the quest of people for generations lies on the other side of the San Bernardino mountains - Los Angeles sprawling all the way to the Pacific Ocean at the end of the Santa Monica Pier - which is where I started this tale about the Mother Road. I really enjoy these posts, Carla. Have you traveled Rt 66 very far? Thanks Vickie! As a kid, we went west a lot on Route 66. Since then, just here and there. Max and I keep talking about doing a "66" trip. Love the posting of Route 66. Thanks, Sharon! Route 66 is/was interesting. Bet you have some great memories!